What? After scooping our jaws off the floor and high-fiving each other for bringing up a baby genius – yes, we have a very broad definition of “genius” – we realized that we mainly have been focused on teaching E about numbers one through five. Where did she learn the rest? So, there you have it. While we would love to take the credit for teaching our daughter to count to 10, it is a talking train that deserves a good chunk of the glory. Plus, Sean gets two editorial thumbs up from Hubby – a motion picture editor by trade – who pays close attention to fast cuts/jump cuts in the videos E watches (“Less cuts the better” is the rule of thumb). 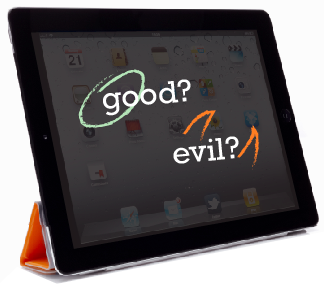 iPad: good idea or terrible idea? Of course, knowing that the time she spends in front of the iPad has positive benefits, definitely helps us feel better about allowing E to iplay. It was a greatly discussed decision in our household. You see, I was not allowed to watch TV when I was a child, and became a horrible TV addict when I finally got free rein down the road (high school, college, life..). It was the forbidden fruit. In fact, only following E’s arrival – via shear lack of free time – have I been able to shake off the lure of endless/brainless TV watching. So, with that in mind, we decided that it would benefit E to learn how to use videos/games/entertainment time properly now rather then binge on it later. We do keep a very close eye on the content she watches, select calm and educational pieces, and set limits on the duration and time of day when the iPad is available. With these guidelines in place, we feel that it has been a great educational tool. In fact, with time, the iPad seems to have become more and more just another thing she does during the day – along with drawing on her easel, playing with her toys and puzzles, reading, exploring the outdoors, etc. – vs. the exciting must-play-now-gimmy-gimmy toy it once was. Here’s hoping we’re not melting her brain instead! What are your thoughts on tots to having access to a tablet or computer? Do you allow yours access to one? If so, what are some of your favorite activities to recommend? Previous Post When Did Girls Start Wearing Pink? Next Post Yeiks! Is your Smartphone Camera Geo-Tagging your Photos? My two year old loves Shawn the Train as also! She has definitely learned quite a bit(colors, numbers, alphabet) from watching parent approved videos as well. I agree with your philosophy that taking the “lure” away from the ipad/computer can make it a healthy part of your child’s development!